‘G-FORCE!’ If you were unlucky enough not to have had your childhood in the late 1970s and ‘80s then those legendary words probably mean nothing to you. But to an entire generation of children they became the call-sign of one of the most celebrated animated Science-Fiction series of the era – so much so that the original name of the show, ‘Battle of the Planets’, was almost forgotten in favour of the name of the team of superhero orphans that it focused on: G-Force. Aided by their robot mentor and guardian 7-Zark-7, the team’s mission was to protect the Earth from the forces of a hostile planet called Spectra and its evil leaders, Commander Zoltar and his mysterious master, the Luminous One. 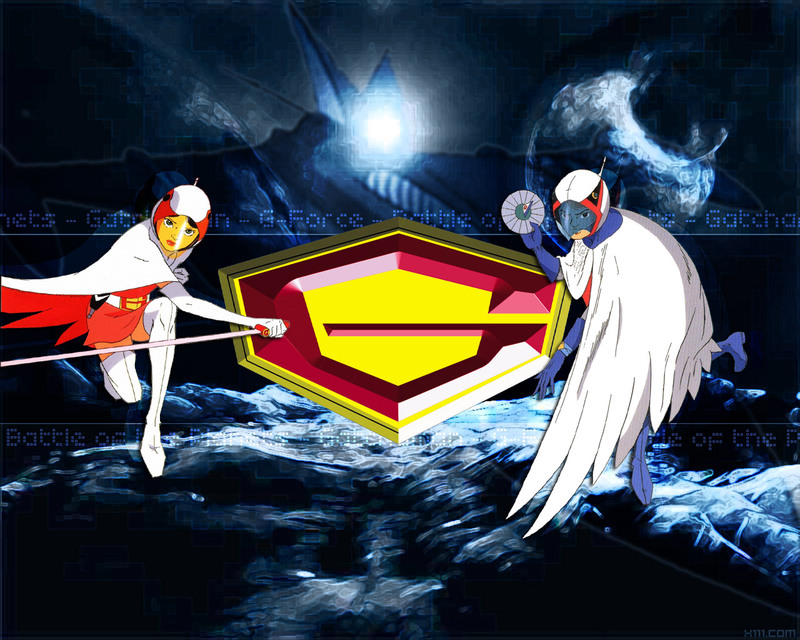 An American television adaptation of an original – and much darker – Japanese anime series called ‘Science Ninja Team Gatchaman’ (1972), it remained fairly faithful to its source materials and aired for some 85 episodes, becoming for many the animated version of the contemporary live action cinematic hit ‘Star Wars’, and just as popular. The G-Force team consisted of Tiny, Keyop, Mark, Princess and Jason, who had extraordinary powers (which were never quiet explained, including the admittedly silly tornado-like ‘Whirlwind Pyramid’) coupled with high tech vehicles and devices, the most famous of which was their spaceship, the Phoenix, which carried the specific vehicles of the individual squad members. One was a futuristic, weapons-laden race car driven by Jason, hidden in the hollow nosecone of the Phoenix. The second was a hi-tech motorbike belonging to Princess and stored in the left wing capsule of the mother-ship. The third was an all-terrain, tank held in the right wing storage capsule and which belonging to Keyop while the last was a jet fighter piloted by Mark, stored in the top rear section of the spaceship. The fifth crew member, Tiny, was the permanent pilot of the Phoenix so had no detachable craft of his own. The team members wore bird-like costumes with wing-like capes that could fan out and function like parachutes enabling the G-Force members to glide down from heights, while they themselves were endowed with martial arts skills, ninja-like weapons, and strange ‘cerebonic’ powers to defeat their enemies in combat. The American adaption was in some ways very different from it Japanese original, though child-viewers at the time (and most of their parents) were unaware of this. The more adult nature of ‘Science Ninja Team Gatchaman’, with its graphic violence, profanity and transgenderism, was carefully toned down to create a kiddie-friendly show more suited to American tastes, and with cues taken from the ‘Star Wars’ movies. This created some narrative problems which were usually fixed by the simple device of voiceovers or explanations (usually by the robot 7-Zark-7) of off-screen events. Yet the show still retained much of the narrative drive and characterisation that made its original version such a success in Japan. Added to this was the very high quality of the animation, with stand-out features being the Phoenix spaceship and the alien fighters and uniforms of the forces of Spectra. Enormously popular at time, feeding into the desire for more Sci-Fi themed programs on TV for young audiences, ‘Battle of the Planets’ has retained much of the affection it was once held in by its now adult viewers. Though inevitably dated, and dramatically inferior to the original (which was after all as much aimed at adults as it was at children), it has stood the test of time surprisingly well for what was basically a heavily re-edited American adaptation of an original Japanese anime series. A huge (and heftily priced) compendium box-set is available of the entire series, which includes several extras, and for those who hold particularly fond memories of the show it is a worthy purchase – if you don’t expect too much from it.